Hello, Maisy! I love it when another one of your fab adventures hits my bookshelf, and it's great to see you're off to the cinema! I do love a good film. Maisy is very excited to be heading off to the movies--and Tallulah and Charley are just as enthused--especially when it comes to the popcorn! But what film will they go and see? There's so many to choose from, and they all look fabulous. Finally, they settled on 'Hero in the Jungle', snaffle their candy bar treats and make their way into the darkened cinema. Cyril feels a little scared as the lights go down, but Maisy is there to hold his hand. When Eddie sees movie star Troy T. Tiger onscreen, he shouts out in glee. Everyone else in the audience goes 'Shhhh!' and Quiet!' The movie is funny. Charley laughs so much, he spills popcorn all over the floor! A quick dash to the loo during half time, and Maisy and friends enjoy the rest of the movie (including a scary scene and much covering-of-eyes) before chatting in the cafe (over juice) about their favourite parts of the film. 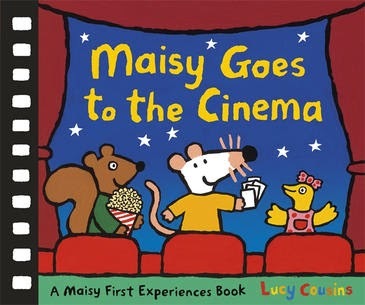 Maisy Goes to the Cinema is yet another lovely peek into the lives of little kids that Lucy Cousins does so well. I almost feel like I'm a fly on the wall with these books, delighting in the childlike antics and ways of the very young. The classic Maisy colours and dark outlines pop from each page--making this short narrative ideal for babies, too.